This bronze bust of Giuseppe Pianese, by Antonio Mennella (1901-1964), can be seen in Civitanova del Sannio (sul "Terrapieno", in front of Giuseppe Pianese's birthplace, via Roma). On the marble basament an inscription reads as follows: "ALL'ILLUSTRE CONCITTADINO / PROFESSORE GIUSEPPE PIANESE / INSIGNE ANATOMO PATOLOGO / L'AMMINISTRAZIONE COMUNALE DI / CIVITANOVA DEL SANNIO / RICONOSCENTE ED ONORATA / PONE / 26 LUGLIO 2003." 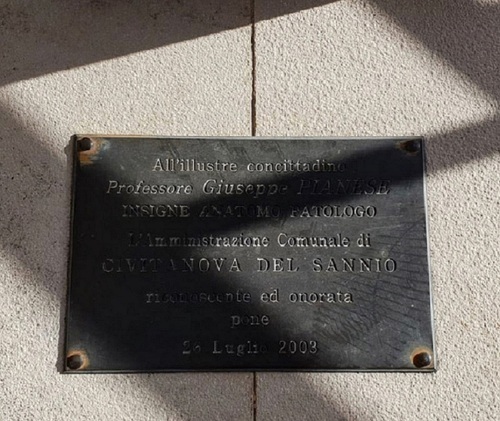 The epigraph means: "To the illustrious citizen / Professor Giuseppe Pianese / diguished pathologist / the municipal administration of / Civitanova del Sannio / grateful and honored / poses / 26th July 2003."